Have you ever experienced pain in your back or knees? It could be because of your hip joints. The joint that links your pelvis (a strong support structure on which your spine sits) to your legs is known as the hip joint. Your hip joint is a synovial ball-and-socket joint which means it is made up of a round ball portion at one end of the thigh bone and the domed socket portion of your pelvic bone. This anatomy is what allows great freedom of movement of your hip joint. It allows you to stand straight upright while still giving you the ability to bend, kick, run, jump and just be very mobile. On the other side of it, because your hips are made up of this ball-and-socket construction, they are also very vulnerable to too much movement which can lead to shifting and pinching and eventual wearing down of the joint, injury and pain. This vulnerability along with its central location to affecting many other areas of your body can make the hip joint quite the bully when it’s not working well. More stable joints like the elbow or knee, which are hinge joints, only allow a joint to move primarily one direction. 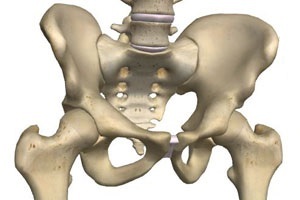 And while they can affect bones and joints nearby, they do not do this to the extent the hip joint does. Believe it or not, because of the great amount of mobility in the hip, you can sometimes acquire injury and pain in your hip, knees and back just from sitting too long. To understand how this happens, you need to realize how the hip joint is given strength. To stabilize the hip joint, you have strong muscles surrounding and aiding it for movement. They work to give the hips strength and stability and provide you with the motion you love. However, when these muscles are kept in a shortened or tightened position too long, with prolonged sitting for instance, they may stay that way when you get up too. This means powerful muscles are pulling tightly on the hip joints even though you’ve stood up and started walking around and they should be at a more lengthened and relaxed position. One of these big powerful muscles is called your iliopsoas muscle. It attaches by your spine – or your back bones and at your thigh bone (the femur). It works to raise your leg forward and rotate it outward. When it stays too tight because of prolonged sitting, it can pull the ball of the thigh bone forward in the domed socket and can pinch the hip joint, leading to pain. Additionally, this tight muscle may pull tight and steady enough that it causes you to walk bent forward. When you’re bent forward, you have gravity working against you on most areas of your body which puts more stress on your whole spine all the way to your neck. This may also cause painful pinching of the joints in your back. And if all that doesn’t seem harmful to your body, well-being and ability to move at your best…additionally, if your iliopsoas muscles are left tight and shortened, they can put more stress on your knees because they rotate your legs outward. Walking with a slight outward rotation in your knees can cause the knee joint to be off balance, not work well and eventually lead to abnormal wear and tear and pain in your knees. As you can see, a small imbalance just from the hip muscles can lead to bigger problems in other areas of your body if they are not taken care of. But a bully can only stay a bully if left unchecked. Make sure you pay attention to your body and if you’d like an experienced opinion about what’s happening with your hips, back, or knees, we’ve helped hundreds overcome pain that holds them back from moving and feeling their best. You may be intimately familiar with muscle knots in your body. Practitioners sometimes refer to these knots as “trigger points”. It’s the painful feeling of a tight muscle that just won’t release. It’s often felt when you aren’t doing a thing…it just keeps grabbing at you and sticks around when you wish it would go away. Muscle knots occur when surrounding muscle tissue contracts around a hyper-irritable or stressed spot within the muscle. It causes hard nodules or bands to form along with tenderness, stiffness, and pain. These muscle knots/trigger points may be the source of what’s called referred pain. This is the pain felt in one part of the body that is actually being caused by a trigger point elsewhere. Often, because of this, the trigger point and the pain do not appear related. Usually our muscle knots involve a small area of muscle tissue that continually contracts. They can be deceiving because while the area is small, the pain can radiate to larger areas or even areas that contain no muscle tissue such as your joints. As your tight, contracting muscle pulls on tendons and ligaments around a joint, it may feel like the pain is actually coming from within the joint itself when it is not. This can lead to a lot of unnecessary treatment that won’t solve the real issue. Muscle knots often appear after a muscle spasm. Those knots then create additional muscle spasms elsewhere, leading to more knots in a sort of endless loop. A tightened muscle reduces the blood supply to the area creating an even greater problem since muscles deprived of oxygen-rich blood create lactic acid, which irritates the nerves and adds to the increased feeling of soreness in the muscle. You will probably find that your particular trigger points are frequently located in the same places, such as a point in your shoulder that always seems to be knotted when you are under stress. However, this can change if efforts are made to get your body properly balanced. The reason you should take these muscle knots seriously is because they can be a key cause of your headaches, neck, and back pain. Relaxation is important. Learn to identify when you are holding muscles in a tightened position and then allow them to release. Use meditation, breathing techniques and exercise to handle stress. Be mindful of how you’re holding your body so you are not sitting awkwardly, lifting poorly, or holding your head turned during a presentation or movie for too long. Holding your shoulders high can also lead to strain. Be sure to drink enough water as it will flush out the toxins that tend to accumulate in the muscles that cause the vicious loop of muscle spasms. Get the proper nutrition — including sufficient amounts of potassium and calcium in your diet is essential for the health of your muscles. Bananas provide a good supply of potassium and green leafy vegetables are good sources of calcium. Release painfully knotted muscles by breaking the cycle of spasms and knots. With a variety of proven techniques we can help prevent the same pain from returning again and again. Life’s stresses will continue on as they do. You can however be released from the cycling grasp of painful muscle spasms. We even have experience helping those athletes who stress their bodies the hardest, finally get relief from pain. Put your whole body at rest and allow yourself to proceed through the day with ease. Contact us for an easy, no obligation consultation.